ALAN, Wayne, Merrill, Jay, Donny (cue screaming), Marie and Wee Jimmy - for more than five decades the Osmonds have entertained capacity audiences around the world. 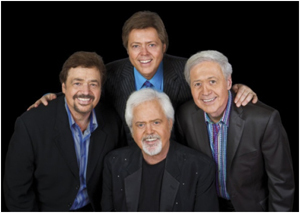 So it’s surprising to discover that their current tour is their biggest ever in the UK, especially as The Osmond Brothers are now reduced to a three-piece - Jay, Merrill and, of course, wee Jimmy, now a 48-year-old father of four. Sadly, Wayne, who was billed to appear, has had a stroke and will not be performing. But this is no ordinary tour, according to the brothers, this is their farewell tour. “We truly want this tour to be a great big thank you to all our fans for their love and support through the years,” says Jimmy. The concert, at the Usher Hall on Sunday, will take fans on a journey through the years and feature many of the Osmonds unforgettable hits, classics such as One Bad Apple, Down By The Lazy River, Let Me In, Love Me For A Reason, Crazy Horses and Long Haired Lover From Liverpool, the 1972 No 1 that saw Jimmy join his siblings in the world of pop. Unique in their success, the Osmonds have, between them, recorded more than 200 albums, sold more than 100 million copies and garnered 59 gold and platinum recordings. In 2003 when they were honoured by the industry, receiving a star on the Hollywood Walk of Fame. As for it being their swansong, Jimmy offers, “This is the legacy that my brothers have created and this is their wish.